Sweet writes postmodern pilgrims must strive to keep the past and future in perpetual conversation. 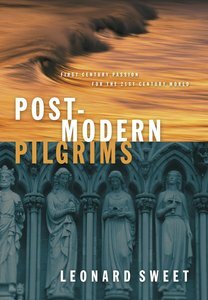 "Postmodern Pilgrims" addresses and answers the tension existing between tradition and modern innovations and shows how the Gospel can be enculturated in every time and place. There is a legend of a Welsh Prince Madoc whose ship became stuck in Chesapeake Bay. After trying unsuccessfully to escape, he had his men row out with the anchor, drop it as far into the sea as they could, and then the ship winched its way forward. The image of the church as a boat and tradition as an anchor is prevalent in Christian art. If we examine the biblical view of an anchor, we find, like Prince Madoc, we are to cast our anchor into the future and pull the church forward. Postmodern pilgrims must strive to keep the past and the future in perpetual conversation so every generation will find a fresh expression of the Gospel that is anchored solidly to "the faith that was once for all delivered." Leonard Sweet (PhD., University of Rochester), is founder and president of SpiritVenture Ministries and serves as the E. Stanley Jones Professor of Evangelism at Drew Theological School in Madison, New Jersey. He also is a Distinguished Visiting Professor at George Fox University in Newberg, Oregon, and the chief writer for preachingplus.com, a resource for pastors and other Christian speakers. A popular speaker himself, Sweet has written more than twenty books, including The Three Hardest Words, Out of the Question Into the Mystery, AquaChurch, SoulTsunami, and SoulSalsa.